Shirdi Sai Baba Devotee Rashi Vashist From India Says : Om Sai Ram. I am from MP-210 Mahaparayan group. I believe in Baba very much. I have full Faith in him. Whatever I have asked Him for, He has given me and has always given what is right for me. I said Baba "Bhohath din hogaye apne mere dream main akar baat nahi kiya. Aaj apko aana hee padega"(which means, "Its very long time that You have not come in my dreams and have not talked to me. Today at any cost You have to come"). And then I asked Him "Baba Parayan karte rehne se sab thik hoga na"? (which means, "Baba doing the Parayan everything will be alright"?...). Saying this to Baba I slept. Then I got a beautiful dream where I saw a poster or a picture of Baba in which the same thing was written "Keep Doing Parayan Everything Will Be Fine" as is written by Pooja ji always at the end of mahaparayan experiences (Keep Doing Parayan Good Things Will Surely Happen). I asked Baba where are You? Then I heard Baba's voice "My Child I am Here With You And With Everyone. Just Keep Doing Parayan. Sab Thik Hoga. Main Sabki Wishes Puri Karunga. Sab Accha Hoga, Tumhari Aur Sabki Life Mein. Bas Shant Raho, Aur Parayan Karte Raho, Aur Khush Raho" (which means, "Just Keep doing parayan and everything will be alright. I will fulfill everyone’s wishes. Everything will be good in your life and in everyone's life. Just be calm and keep doing Parayan and Be Happy"). My dream ended here. It was not just a dream, but it was truely Baba's words which Baba had conveyed his Beautiful message to all of his children through this dream. Such a Beautiful and Blissful dream it was. Om Sai Ram. 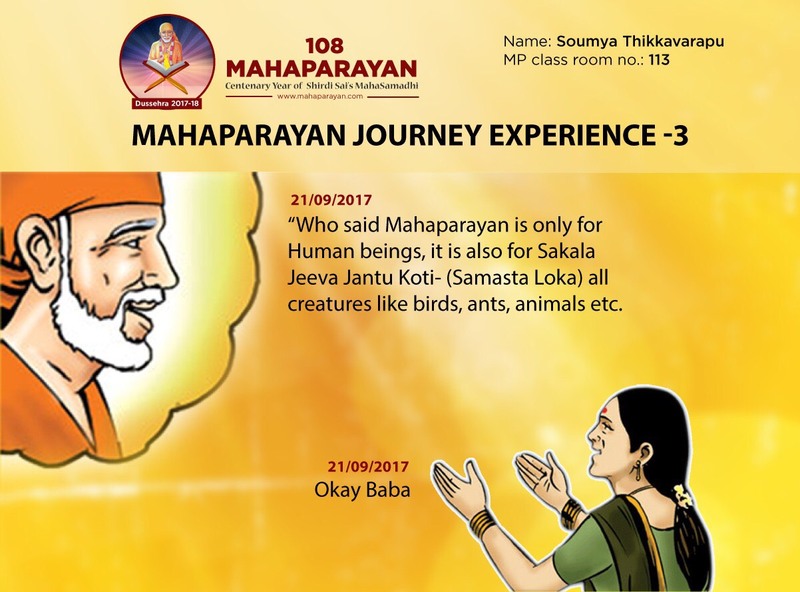 Thank You Rashi ji for sharing your experience and conveying Baba’s message to all His children who are already part of Mahaparayan and losing hope thinking Baba not listening to them and also to those whom Baba wants to pull in for Mahaprayan this year. This clearly shows everything Baba is controlling and we need to have patience; as soon with collective prayers and positive vibes things would turn out good not only for human race but also for every minute animate and inanimate element in the Universe as per Baba’s assurance to one more devotee Soumya ji (Baba Says Mahaparayan Is For Samasta Loka). Love You Sai. Jai Ho Sai. Thank you Rashi ji for sharing ...very beautiful . Very true ji, coz one of my friend told it would be stressful to read the chapters on d day itself and one would not be able to read with devotion.... But I replied it is d faith on Baba that makes us read,, as Baba has taught us we must have shraddha n sabhuri, the rest 's with Sairam....if we have these two Baba 's with us always.. Wonderful experience. You are soo blessed. Baba please keep blessing all beings in the universe. Om sai ram. OM SAI RAM. Thanks Rashi ji, for sharing this beautifull dream of yours & for giving us the DIVINE MESSAGE from our SAI. Thank you so much Rashi ji for coveying Baba's message to all of us. It's so amazing that you experienced Rashiji ! Blessed is your soul. Our hopes get reinforced when we get to hear those words " "My Child I am Here With You And With Everyone. Just Keep Doing Parayan. Sab Thik Hoga. Main Sabki Wishes Puri Karunga. Sab Accha Hoga, Tumhari Aur Sabki Life Mein. Bas Shant Raho, Aur Parayan Karte Raho, Aur Khush Raho" (which means, "Just Keep doing parayan and everything will be alright. I will fulfill everyone’s wishes. Everything will be good in your life and in everyone's life. Just be calm and keep doing Parayan and Be Happy"). Thank you Hetalji and Pujaji for posting this wonderful vision of Baba ! Bow to Sri Sai. Peace be with you all. Om Sai Ram. Rashiji, you are truly blessed. I have just joined the mahapranayam group and I seek His blessings sincerely. Om Sai Ram. 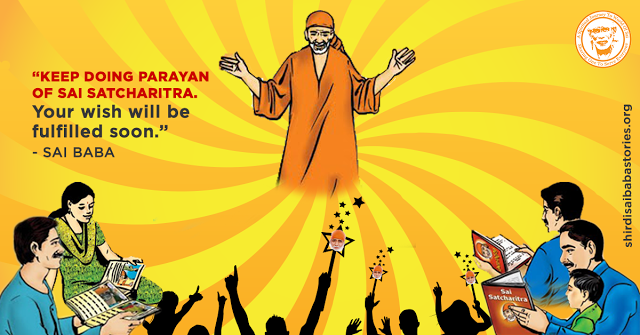 Its true that our Lord Sai is watching us and lead us the way to enlightenment. We should be patient and keep doing the parayan. We all are truly blessed of coming together from various walks of life with a sole aim of Lord Sai's krupa. Jai Ho.